Get some historical perspective at Rock Church and Helsinki Cathedral. 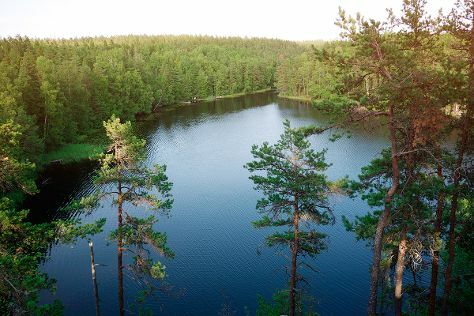 Visiting Nuuksio National Park and Arboretum Mustila will get you outdoors. Get out of town with these interesting Helsinki side-trips: Teijo national park (in Pernio), Bellevue Beach (in Hanko) and Raseborg (Fagervik Church & Ekenas Archipelago National Park). Spend the 6th (Sat) exploring nature at Sipoonkorven Kansallispuisto. There's lots more to do: brush up on your military savvy at Sea Fortress Suomenlinna, take a stroll through Ullanlinna, look for all kinds of wild species at Riverside Park, and explore the striking landscape at Hiidenkirnut. If you are flying in from United States, the closest major airport is Helsinki Vantaa Airport. In July, plan for daily highs up to 71°F, and evening lows to 55°F. Cap off your sightseeing on the 15th (Mon) early enough to travel back home.